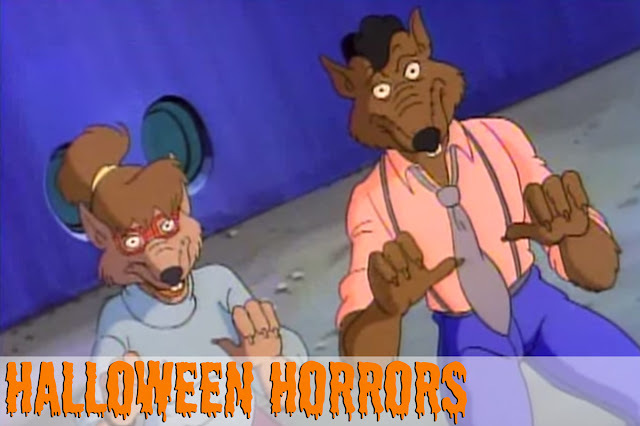 Let the Halloween hijinks begin with Were-Rats From Channel 6 from Season 4! While searching the sewers for food with his rodent subjects, the Rat King discovers a canister of mutagen. He hatches a diabolic plan, kidnapping Irma & Vernon, using the found mutagen (which he refers to as "Rat Tonic") to transform them into his mutant slaves. Using his hypnotic flute, the Rat King commands his two new minions (were-rats!) on a mission to raid the city for food. In the process, they learn of a gigantic cheese supply that will soon be boarding a plane. Bebop and Rocksteady conveniently wander in - determined to steal the very same cheese crates (which are actually filled with explosives, not cheese). Mayhem enthuses in an all-out brawl between mutants, humans, rodents, and were-rats! Were-Rats From Channel 6 is packed with Halloween buffoonery. 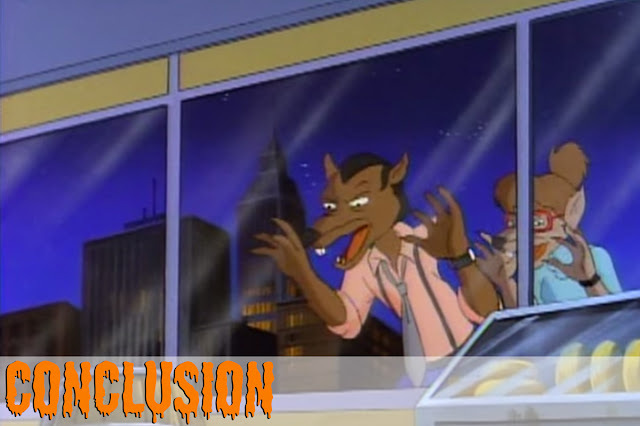 Irma & Vernon's iconic Wolfman-like mutations are the most obvious. Classic imagery of dark skies and full moons accompany their gnarly transformation. The Rat King's flute also provides a creepy Halloween soundtrack throughout the episode. Its sleepy, yet haunting, melody sends cartoon chills down your spine - whether you're an 8 year old kid or a 31 year old adult. Irma & Vernon are the freaks in the spotlight. Visually, they're hideous. Their snarling teeth and Splinter-like faces often made me feel uncomfortable watching the episode. Not to mention, a were-rat in a pink collared shirt with a necktie? That's a bizarre, Halloween sight for sure. Audibly, the mutated duo aren't spooky at all. Their voices are completely normal, no sound adjustments to crank up the scare level. The mutagen the Rat King uses to mutate Irma & Vernon is hair-raising grotesque. Sure, it looks cute for a cartoon, but imagine what this gunk would look like in real life? Raphael refers to its layered, vibrancy as "tutti-fruitti" - an uncomfortable description that no one wants to experience oozing down their face. 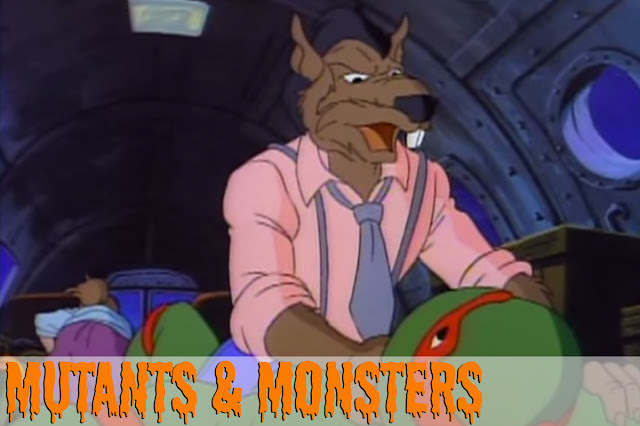 Every original TMNT episode is loaded with goofy moments that will make your groan. Were-Rats From Channel 6 is no different. 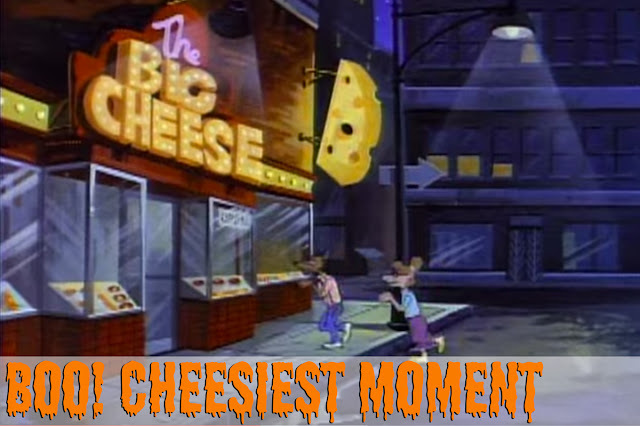 The cheesiest moment of this cartoon literally involves cheese. Irma & Vernon are on a dopey quest throughout the story to steal cheese in bulk. When they scamper into The Big Cheese, a massive jewelry store-like shop dedicated to cheese, I cringed. Not because it was scary, but because it was so incredibly stupid. 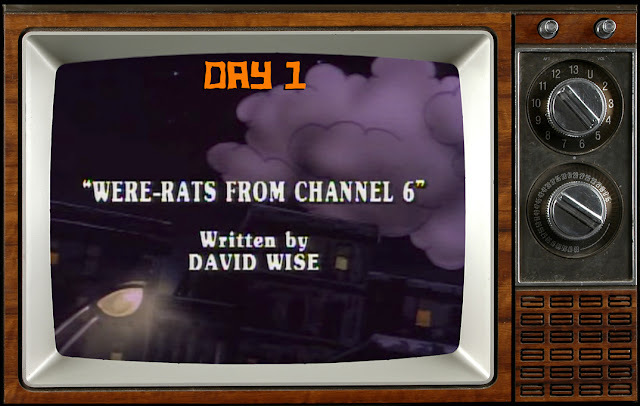 Were-Rats From Channel 6 might be a forgettable episode if you watched it in the dog days of summer. But on a chilly October evening, it's a fun romp that twists the classic Wolfman tale and bites you with Halloween spirit. A few stupid sequences can be easily overlooked when there are two deformed side characters taking the spooky spotlight. Just hide your cheese from these bozos. Check back tomorrow for Day 2 of Horrors In A Halfshell!